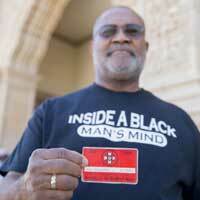 Retired Detect Ron Stallworth shows off his official Ku Klux Klan membership card. Stallworth's undercover investigation into the Klan is now the subject of a hit Spike Lee film. ST. LOUIS - Ron Stallworth, a retired black police detective who infiltrated the Ku Klux Klan (KKK) in the late ‘70s, will speak at Webster University at 7 p.m. Oct. 12 in the Grant Gymnasium on the Webster Groves campus. The event is sponsored by Webster University Multicultural Center and International Student Affairs. Stallworth’s amazing story about how he managed to convince David Duke and other members in the KKK that he was white is the subject of director Spike Lee’s hit film “BlackKKlansman,” currently in theaters. In the book, Stallworth revealed that he posed on the phone as a white person who hated all minorities. When he was required to attend KKK meetings, he sent a white officer in his place. During Stallworth’s nine-month investigation, he discovered that several active members of the KKK were high-ranking service members in the U.S. military who had access to restricted weapons and nuclear codes. As a result of his investigation, those people were reassigned to other duties. Stallworth worked as a police officer until he retired in 2005. In 2014, he wrote his autobiographical book “Black Klansman” which focused on his early career. In it, he revealed that he not only received a membership card to the KKK, but he framed it and hung it on his office wall where it stayed for many years. Tickets will go on sale online Friday on Cashnet. Current Webster students can receive two free tickets and can purchase additional tickets for $10; Alumni, faculty and staff can purchase tickets for $15 each; and the public can purchase tickets for $20 each.